Can the Reflector Cover Hide You from Red Light Cameras? 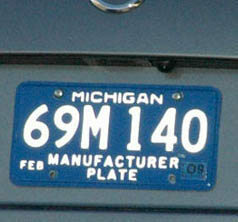 Red light camera's violation photo of Michigan plate behind the Reflector Cover. Rating: ineffective. See how the Reflector Cover compares with similar products. The surface of this cover is sprinkled with something called "light-reflecting crystals" claimed to amplify the intensity of the camera flash and overexpose the image. Although the cover must be held close to the eye, the little specs are there, embedded in the surface. They look suspiciously like party glitter. Regardless, our red light camera wasn't impressed. Whatever the composition of this magical pixie-dust coating, the camera ignored it.